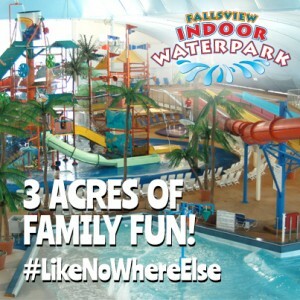 With direct access to the Fallsview Indoor Waterpark you won’t have to go far to have a fun filled day in Niagara Falls. The Waterpark Package offers an exciting adventure with your family to the largest indoor waterpark in North America. Enjoy three acres of fun including 16 waterslides, a splash park, indoor and outdoor sun deck, play areas and delicious dining options. Stay at our luxurious hotel with amenities for the whole family and enjoy with a short walk to the Fallsview Indoor Waterpark. Don’t let the fun stop there, with direct access to attractions at Falls Avenue Resort, its easy to enjoy Adventure City, Hershey Chocolate World and much more. For dining options the hotel is linked to the Perkins Family Restaurant where you can grab breakfast, lunch and dinner. The restaurant offers all sorts of food options that will satisfy the entire family. For adults looking to have fun, make your way to Casino Niagara just a few steps from the hotel. With 45 gaming tables, 1,700 slot machines and Yuk Yuk’s comedy club, your evening will be filled with entertainment. The hotel strives itself on being a perfect location for the entire family to enjoy Niagara Falls. Kids Stay and Eat Free at Skyline Inn when you purchase an entrée. Choose from Planet Hollywood or Perkins Restaurant and the kid’s will receive their meal free of charge. After dinner make your way to the hotel lobby for Family Movie Night. Bring your pajamas, snacks and blankets and watch some of your favourite family classics on the big screen. The perfect destination for the entire family and a package that won’t disappoint is all found at Skyline Inn. Make Niagara Falls your next family vacation for a fun filled getaway.